Messing around with making a few Christmas ornaments from some files I purchased. 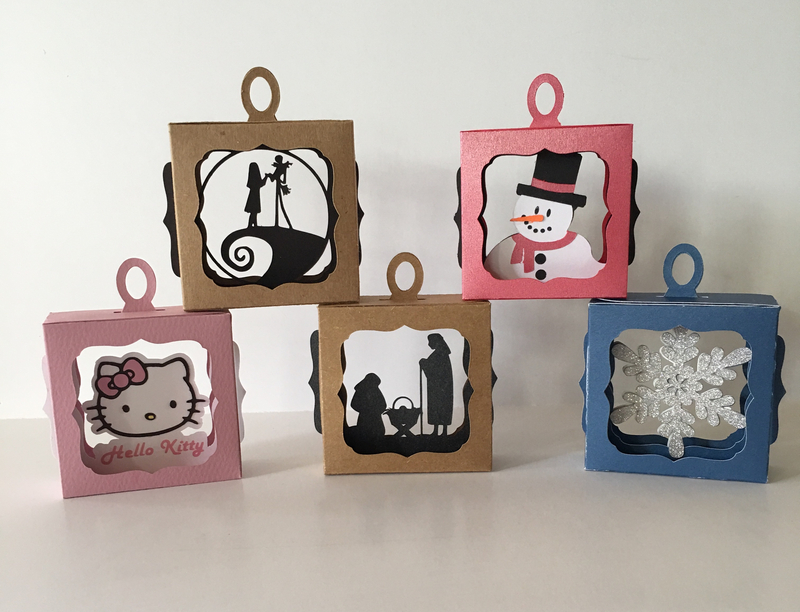 The Hello Kitty and The Nightmare Before Christmas were designs that I came up with after making the nativity scene, snowflake, and snowman, which are from Pazzle Craftroom. These are very easy to make and you can come up with your own inserts. @Penny - Lovely, Penny, nice work! I bought some of these files as well. Did you bring them into MTC? @Liz_A Thank you. Yes I did bring them into MTC and also changed the score lines from dashes to solid lines. @Penny - I did as well. Did yours come into MTC as a very small size, like postage stamp size? Like these - this idea has potential to expand further. Yes it did. I looked at the size of them in my Silhouette software and then resized in MTC. Not sure why it came in so small. @Penny - I have been doing some research. The Designer Business Edition of the Silhouette program has a bug in it when it saves to SVG. When it creates an svg file, it includes the overall size of the project, so lets say the overall size is 6 inches wide by 4.25 inches high. The Design software expresses the size in millimeters (mm). Being as SVG files are text readable, I opened all the svg files I have bought from the Silhouette Design store and found that when it expresses the size, ie width and height. it puts the mm for the width but not the height. So if you open in the Business version, the program must be able to render the file based on one of the measurements...otherwise the file would "fail" in Silhouette Studio and just be postage stamp size there as well. So I "fixed my files by adding the mm in the height value, where it is missing. And that works great! I have sent emails to both designers - Lori Whitlock and Suzanne of Quiet Fire - so at least they will know where the issue is when customers complain about not knowing what the size of the file should be. Hope that helps!!! @Penny very nice indeed! Thanks for taking the time to post your photos too. I do so love to see other folks' ideas and work. So, these are little shadow boxes; is the center of each one interchangeable? I thought it might be because of the wavy edges. I can see all the separate layers in the deer card. Yes the center or centers in the shadow boxes are interchangeable. 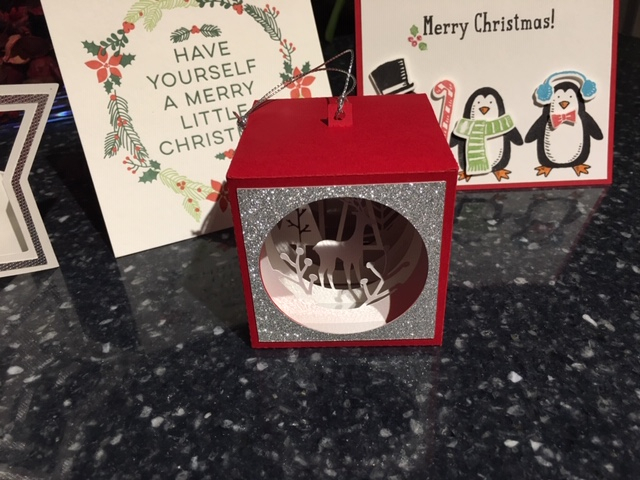 I purchased the Nativity, Snowman and snowflake files and then made the inserts for Hello Kitty and The Nightmare Before Christmas. The designer of these also have several with several inserts in them. The Deer Cube file is from another designer. The Deer Cube is a little harder to get together. Small space to work in to get the layers in correctly. @Liz_A ; Dummy me also purchased the SVG files from her. And as you stated, they came in too small. I just took the Studio3 file and used the online converted from Studio to SVG and it converted it to the correct size. I should have done that to begin with. No more buying the SVGs from the Silhouette store. Not sure why I did purchased the SVGs (as I said DUMMY ME). Yes it also came from Pazzle Craftroom. 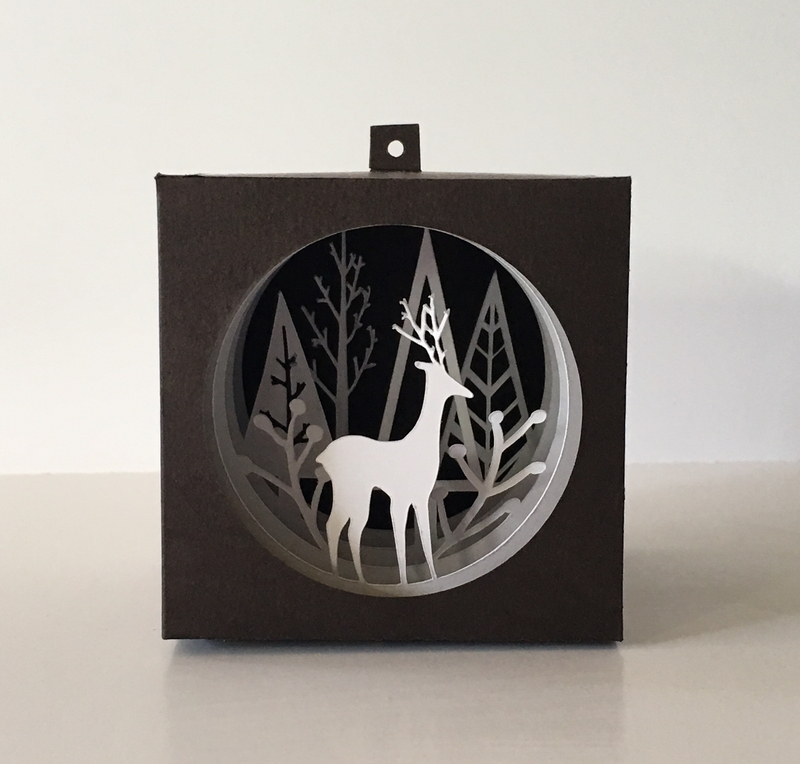 The name is Deer Cube Ornament by Silhouette - Design ID 282051. These are fabulous! Thanks for the photos! Thanks @Penny for sharing your projects here! I fell in love with that deer cube. This is my second version of it...added a silver mirra paper to the back and bottom inside, and Michaels Recollections super fine glitter paper to the front. Picture doesn't do justice to the cuteness factor! Oh @Liz_A that is so pretty. What is silver mirra paper? Liz, I love the glitter paper you used. That's cool! @SandyMcC - that is the superfine Michaels glitter paper, has a thin plastic feeling backing, cuts like butter, and no mess . Love it. Gorgeous colours. Thank you @Liz_A. I will take a look at the link you sent. I it sounds pretty.